"Colonies of walruses, couched in silent contemplation, drifted past on the floating ice — sometimes heading west, sometimes heading east — content to be borne along aimlessly by the tides." Certainly unknown to him at the time, this description could apply to train riders as well. With blocks of floating ice replaced by boxcars, we often have no more control over our direction or speed of travel as a walrus, always at the mercy of winds or tides. As soon as one relinquishes their itinerary to the whims of the railroads, the true joy of freighthopping becomes apparent, and all of its shortcomings are lost in the sensation of movement for the sake of movement alone. No schedules are necessary, because they don't apply. The "language" of train riding doesn't include the word "late"... you get there when you get "there". In a sense, you're always "on time". After Albanov and his companions had to abandon their ice-bound ship and try to reach land on foot over the ice, they experienced a very depressing condition owing to the fact that the "ground" that they were walking on was really floating (and drifting) ice, and after 10 hours of walking at a pace of 1 mile per hour southward, they had also drifted a like distance northward, leaving them no closer to real land than they were to begin with. Their lack of measurable progress and the miserable weather conditions they had to endure closely paralleled my own thoughts as I lay in my sleeping bag, waiting for a northbound train. The once overpowering drive to be moving, on a train, anywhere, had passed for the moment, replaced by an equally powerful desire to either fall immediately into a deep, satisfying sleep or gain enough energy to pack up my gear and walk to the other end of the freightyard, for the sheer joy of "going someplace", even if it was only a mile away. I seemed to be trapped in the in-between, the world of lethargy and stagnation. I had little desire to walk aimlessly around in the dark, trying to perceive the best possible spot to find a ride on the next train with the least effort, nor was I able to relax enough to catch some real sleep, because every passing semi on the freeway above the yard could have been the low drone of the next northbound. This was not shaping up to be the adventure-laden escape I needed from my day to day existence — I was in worse shape now than when I left the house, and I'd only travelled 25 miles by truck and 2 or 3 on foot. The far off diesel horn startled me so much that I was unable to tell where it had originated from, north or south. Seconds later another chorus distinctly came from the south, and a jolt of energy transfixed me. Rolling up my gear for the umpteenth time, but now almost in slow motion compared to my frenzied pace earlier in the evening. Instead of the train overtaking me while still cramming stuff into my pack, I was up and ready before even seeing the slightest hint of the headlight down the tracks. Was I hearing things? I smiled to myself thinking how funny it would be if someone had merely walked out into the south end of the yard with some facsimile of a train horn and let 'er rip, knowing the galvanic response that it would elicit. The peculiar oscillating pattern of an SP diesel headlight began to light up the bottom of the yard, and I backed into the trees to retain some of my night vision. Purposefully looking away from the very object that I had been frozen in thought about for hours, I let the units pass before I looked over to see what and where the rides were. The usual northbound tonight — lots of empty boxcars and almost as many hoppers. Walking over to within a track or two of the crawling train gave me a chance to pick my ride, and maybe find a nice wooden-floored box with both doors open. 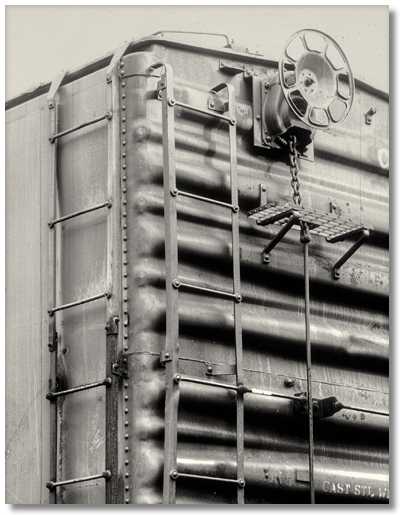 Two or three passed as the train braked to a squealing stop, and minutes later I was "up and in" and once again rolling out my wrinkled gear, this time at the head end of a nice, clean, cardboard-filled wooden-floored boxcar. I walked over to the doorway to take a leak and noticed that after walking back toward the rear end of the train for several minutes, I was now, after more walking along the slowing train, exactly opposite the tree where I had earlier spent several hours waiting for this exact train. Again my desire to actually "go somewhere" was satisfied only by efforts under my own control, and not by the mystical power of riding freights. Maybe the best train trips were the ones we dreamed about in the comfort of our warm homes, and these memories alone were fuel for the real adventure of travel. Crawling again into my still-warm sleeping bag, I wasn't sure if I wanted to collapse into a well deserved sleep or lie awake and savor the feeling of being at last on a train, headed for I-don't-care-where. The sounds of the freightyard — dogs barking, trucks braking on the freeway, the endless rumbling of the nearby river — were gone now, replaced by intermittent creaks and groans, and the hissing of the air in the brake lines. The smells of the freightyard — pine needles, diesel exhaust from the freeway, and wood smoke from the nearby houses — was also replaced by the sawdust covering the boxcar floor and the odor from the still-warm brakes. Two very different worlds just a few feet apart. Looking out the doorway now I noticed that the stars were no longer visible, which meant that I had spent the entire night just a mile or two away from my parked truck. It was almost morning and I'd gotten nowhere. I could have checked into a nice motel the night before, had a delicious uninterrupted sleep, and leisurely walked down to the yard in the morning to catch this very same train. Getting up from my bag and walking again to the doorway of the boxcar, I realized just how different I felt now, after all my travails during the night, than how I would have felt if I had checked into a motel instead. Both paths would have led to the same place — it was the "purpose" that made the difference. I quickly went back to my gear and rolled up once again, just as the brakes released. Dragging everything to the doorway, I jumped down and finished packing on the ground. My "train trip" was over. I had found what I was looking for, and more. Walking away from the train toward town, the black and white of night had changed into the subtle colors of early morning, and I was again reminded of the beginning of The Wizard of Oz, when the movie turned from black and white into color. Maybe they were right, and whatever it was that we were looking for in far off places was really right under our noses here at home — we just had to learn how to look for it in the proper way.